The Blair Witch Project (1999) was a no-budget genre chiller written, directed and edited by Daniel Myrick and Eduardo Sanchez, about student filmmakers shooting a documentary in mysterious woods in Maryland. Its mix of amateur 16mm footage and video diary hinting at the presence of a supernatural stalker made it a perfect Halloween release, and the inspired Internet-based publicity campaign generated sufficient buzz to ensure the film won cult classic status. A year after the original, this surprisingly good sequel returns to the small Maryland town of Burkittsville, with a new cast and a new director, as another bunch of youngsters drive out to the same spot in the Black Hills’ Forest where the supposed uncanny events of the first movie occurred. The name of the game here is urgent scrutiny of what The Blair Witch Project meant, what it achieved (especially in terms of its offbeat approach to marketing independent films), and what, if anything, are the social implications and consequences of blurring the lines between fact and fiction. Jeff has made a lot of money by selling ‘Blair Witch’ memorabilia and souvenirs (including sticks, stones and even local soil) on the Internet, so now he organises his first unofficial tour of the locations where the earlier documentary makers disappeared. As before, it’s the female ‘characters’ that are the most interesting. Kim is a Goth chick who claims to possess second sight, while Erica is a practising witch, complaining that Blair Witch madness has resulted in a smear campaign against Wicca. That said, the key to unlocking the secrets of this phenomena lies in the work of student researcher Stephen, whose own project (a book entitled ‘Blair Witch: Hysteria or History’) is trashed in every sense of the word during a night camping in the woods. 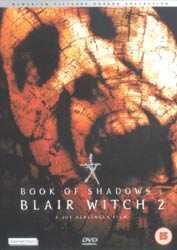 Although Book Of Shadows is, undeniably, a fully professional production compared to its low cost predecessor, and suffers from being derivative of other similarly themed movies, such as The Last Broadcast (1999), it is a thoroughly competent scare fest with scenes and images that would not work at all were this not a sequel. When the seemingly amnesiac campers retire to a video-editing lab to survey footage of their expedition, the tapes reveal strange and horrific events that contradict what we have seen and they (while still ‘in character’) assume and believe. Much more than simply a weary retread or an airbrushed revision of the original, Blair Witch 2 boasts a couple of ghastly shocks (Tristen’s miscarriage in the river is a very alarming nightmare), and suitably ominous commentary about how any cheap CCTV surveillance might be accepted as incontrovertible evidence (have machines finally taken control of our legal system? ), so in spite of negative reviews from biased critics, this one’s worth your time and money. DVD extras: a couple of faux documentaries, Shadow Of The Blair Witch and The Burkittsville 7 add sidebar value to the main feature, and help paper over the cracks. The anamorphic widescreen transfer is enhanced for 16:9 TV, and there’s an exemplary Dolby digital 5.1 soundtrack, which captures the moody ambiance of being outdoors and way out of town at night.